Facing Road Construction? Don’t Lose 33-70% of Your Business! 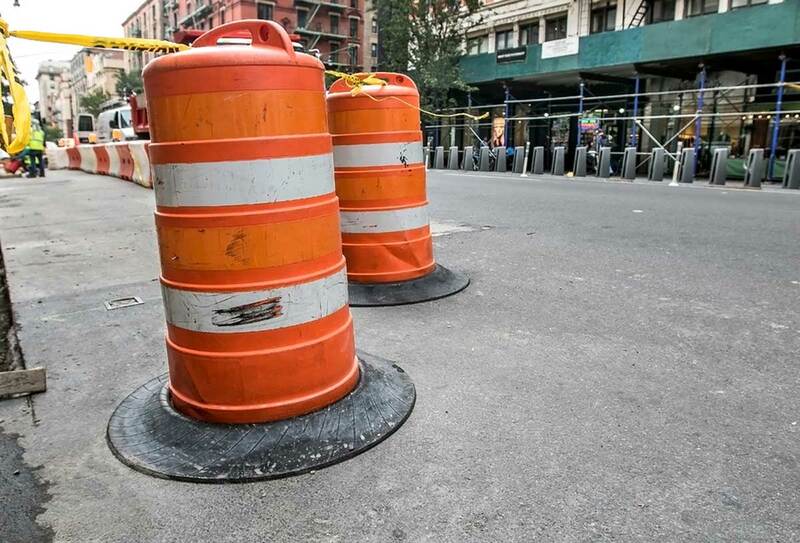 Orange barrels mark a construction project in Manhattan. Extensive road construction can disrupt traffic, hinder parking, and cripple local shopkeepers. Is your business inside the work zone? Then you need to understand how to prevent construction from killing sales. Of course you must be proactive and optimistic about street improvements and their longer-term economic value. But the same time, it’s critical that your customers have access to your location in spite of any roadwork inconvenience. On average, you can expect to lose between 33 to 70 percent of your customers. Where will your business be after long-term disruptions? And what if you’re not located inside the construction zone of a busy street? Are you still facing the prospect of losing sales and profits because of traffic disruptions in your neighborhood? I’ve seen businesses fail because of uncertain detour routes, blocked parking, and poor signage—all of which prevent customers from getting to your door. If they decide “I can’t get there from here,” even your most loyal customers will go to your competitors. I want to help business owners survive noisy, dirty construction work that will disrupt your customers’ buying habits. “The Road Construction Survival Toolkit” is designed to help you plan ahead. It offers 12 different approaches for keeping customers coming back. The goal? Help your customer be confident about knowing how to reach your doorstep with the least amount of inconvenience or delay. Update your website with information about your plans to keep your business accessible. Add links to the project website and/or the City website for updates. Make it easy for your customers to buy online. Use your website to increase sales volume—especially during holiday peak periods, customer birthdays and anniversaries, and seasonal specials. That way, road construction becomes a non-issue for those who prefer to shop at home. Keep your customer information up to date. Use promotions to collect email addresses via your website or in-store signage. That way, you can deliver customer engagement alerts to update them about road conditions, detour routes, parking, and your promotional specials. Consider a weekly schedule to keep them in the loop and less likely to change their buying habits. Are you using any of these ideas to keep your customers coming back? You should! Want know about the other nine strategies? “The Road Construction Survival Toolkit” is a collection of information and advice for businesses needing tactics beyond “business as usual.” There’s nothing else like it available—anywhere! Whether you are a sole proprietor or work in a corporate environment, this guide is for you! It’s the first of its kind and amazingly simple to read and understand. Download This Essential Guide Now! If you download “The Road Construction Survival Toolkit,” you’ll be added to an exclusive list for future notifications about our online strategy sessions to aid your construction mitigation plan. These updates will be offered to both business owners as well as public works officials, so feel free to share this toolkit download link and encourage the business community to get the guide and seminar updates. If you have any questions or would like a consultation about your specific business needs, please contact Nancy Cavanaugh at 414.771.8906 or email nancy@cavanaughinteractive.biz.